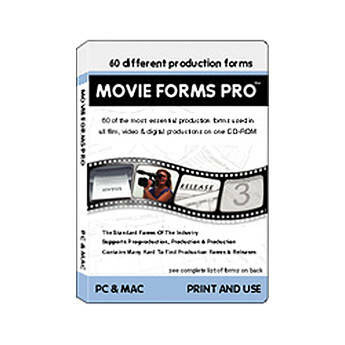 The Alan Gordon Enterprises Movie Forms Pro is a ready-to-use production form system comprised of 60 non-interactive production forms. You can print out the forms and then fill them in with the relevant information. You are provided with A.I.C.P (Association of Independent Commercial Producers) budget forms, A.I.C.E (Association of Independent Creative Editors) budget forms, releases, agreement forms, storyboards, production signage forms, call sheets, and other movie production forms. Box Dimensions (LxWxH) 7.5 x 5.3 x 0.5"